Near-metallic brown - one of the least “chrome"y of the Captivating Color Chromes, but still a useful, attractive color with good coverage. 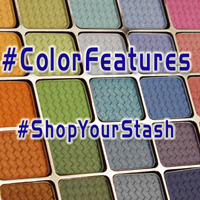 One of five colors in Aromaleigh’s 20th-anniversary collection. This color is a semisheer duotone shimmer, like the other colors in the collection. The coverage can be built up…sort of. Most of what builds is the shimmer rather than the base color.